#4-02 This ornate Brunswick pool table model was used for championship matches during the 1870s because of its superior playing qualities and its general excellence in construction. 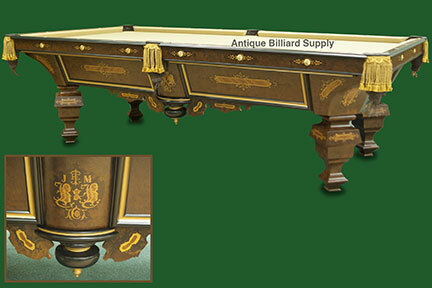 This 9-foot antique pool table features panels of French walnut burl and extensive hand inlays of exotic woods. Fancy inlaid scrollwork and turnings accent the lower edges of the cabinet.